LTHForum.com - Edzo's Burger Shop - Open! Edzo's Burger Shop - Open! 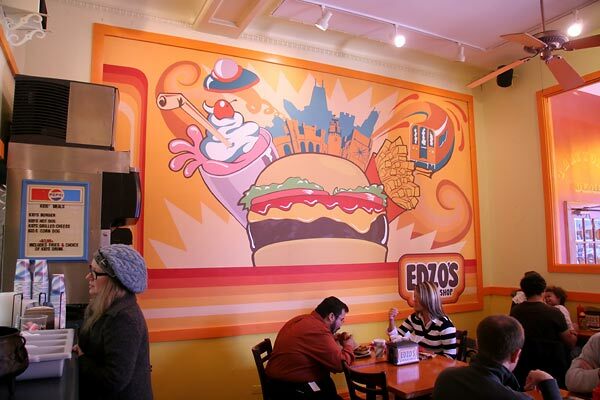 LTH Home > Chat > Eating Out in Chicagoland > Edzo's Burger Shop - Open! 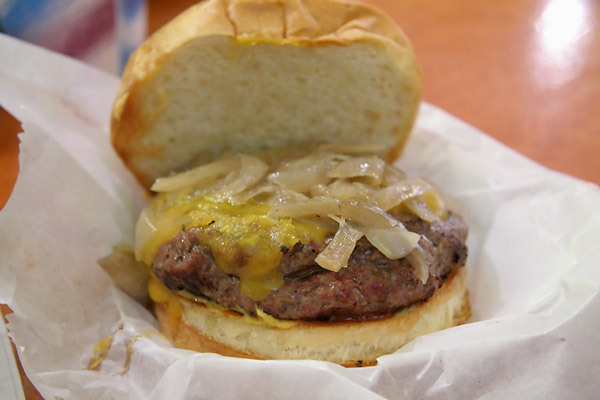 Panther in the Den wrote: Perhaps a higher cut on the pretzel roll used on the char burger to provide a better base? It did hold together well. Is the bun used on the charburger a pretzel roll? If so, then either I misunderstand what a pretzel roll (bun) is, or the restaurant has made a change in the past two weeks. The bun I had was surprisingly (to me) good, and offered good support and was a nice compliment to the excellent meat patty. Thanks, for whatever insight/explanation you can provide to resolve this question for me. You are correct on both counts (on the char and holding up). I would just like to see it cut a little higher to provide a little more support. It appears that it is cut now, maybe, a quarter of an inch from the bottom and a half or a little more would be even better. As you can see from the photo there is a lot of bun on the top! I see what you mean about the upper vs. lower proportions. I found the upper portion to be airy, soft and not very muscular and the bottom to be supportive of what was above. But, as you indicate, a slightly different cut of the bun might prove all-around better. Thanks for the clarification. All of the seemingly (to me) engineered hype seems a bit over the top to me - sort of as if the owner's hired the same publicist as Rick Bayless. Bill wrote: All of the seemingly (to me) engineered hype seems a bit over the top to me - sort of as if the owner's hired the same publicist as Rick Bayless. I know, how dare a new restaurant engage in PR work or otherwise seek attention. Especially with the great economy right now and how easy it is for a new restaurant to succeed in the first place. I can see how it might seem that way, but it's honestly not. I don't have a publicist or a PR company. It's just me and my blogs and my twitter account (and my participation here at LTH forum, of course!). I think the media is just looking for stuff to write about and a former fine-dining guy opening a burger joint hits many of the right notes for them. I find it interesting how some people come here to talk about a restaurant and than slam the restaurant for getting attention. Can't a guy do a good job and get some credit for it? Why does there need to be some PR machine in place? Eddie is doing what he wants to do and if he is getting noticed for it even better. Support the little guy. The small independent businessmen need support and do more for the local economy. thanks, Bob, but fwiw, I didn't take it as a criticism, more of an observation, and I'm glad Bill brought it up since it presented me with the opportunity to set the record straight. Wait - sorry for asking a question that seems answered, but I just wanted to get clarification - are the charburger buns pretzel buns? They sure seemed different from the ones i've had before. These were much softer and subdued. . thankfully so. Ghazi wrote: Wait - sorry for asking a question that seems answered, but I just wanted to get clarification - are the charburger buns pretzel buns? They sure seemed different from the ones i've had before. These were much softer and subdued. . thankfully so. While I have not had the previous pretzel buns, the charburger was on a pretzel style bun. It had a darker outer 'skin' but it was softer than other pretzel buns I have had at other establishments. Maybe a touch of the pretzel flavor was missing but it has been a while since I have had the other pretzel buns and I don't rightly recall. nope, not a pretzel bun. It's from Highland Baking Co. in Glenview and they call it a "small BFB". It's basically a brioche-style bun, but the buttery brioche-ness is toned down quite a bit. Had a fantastic meal at Edzo's today with some co-workers. I had the double grilled burger with cheese, garlic fries, and char dog (just for kicks.) The burger was fantastic- beefy and juicy, although I think next time, I'll stick the the single. Nic soft pillowy bun with snappy pickle and well applied mustard. I am a huge proponent of classical burger proportions, and the single would be just about perfect. The garlic fries smelled wonderful and had a lovely mild garlic taste to them. Ordinarily, I love a heavy garlic hand, but these fries had a nice soft garlic feel, something that added to the fry-ness without contaminating the eater for the rest of the day. I also had several of my co-workers regular fries and found them to be fantastic, with a gorgeous golden brown crispy coating with spudsy soft inside. Really well done, it will be interested to try the "Old fries" that are served well done and extra crispy. 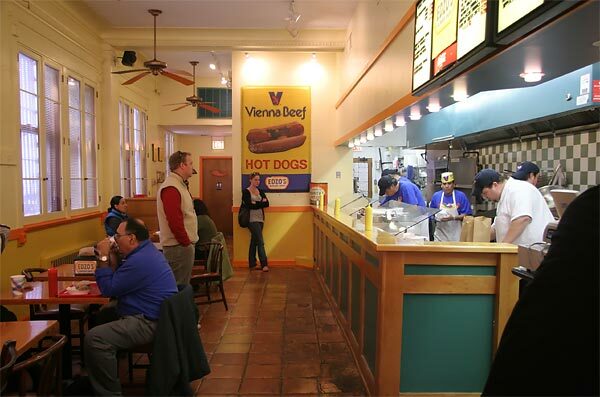 The char dog was a typical vienna with nice snap served in a soft roll. 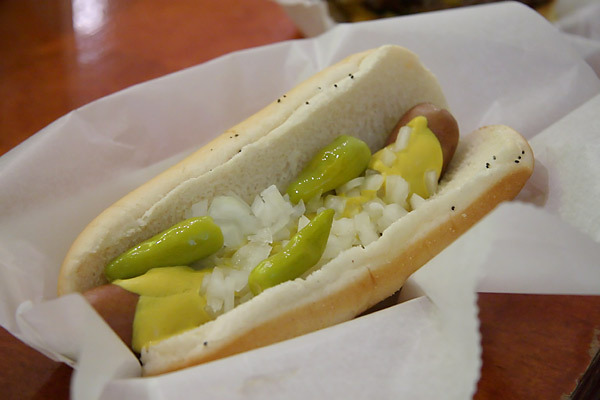 As I have been craving a good dog, it totally hit the spot, but may not be destination dining worthy. After the meal, I was still a bit hungry, so I opted for the nutella shake. WOW! This thing is fantastic - milky, lucious and served at the exact right temperature to be easily consumable. Hats off to Ed, who was manning the register with aplomb, looking a little like Mr. Sohn at a comparable eating establishment a few miles south. Well done, sir! Well done. Forgive a little bit of a rant here. Why exactly is anyone begrudging the owner of a new restaurant's attempts to generate some heat about his new business in a down economy in an area where an astronomical number of new ventures fail. I have not made it to Edzo's yet but I, for one, appreciate that attention is being directed at Edzo's as opposed to any number of fudruckers-type burger places that might open and fail quickly. I find it easy to get excited about a new place that serves *gasp* house ground hand formed burgers, fresh cut fries and high quality hand-dipped shakes. I noticed later in the thread that elakin says all of the pr is his own doing...good for you---it proves that a good product doesnt need PR professionals to get noticed and to get people excited about a new restaurant. I think the hype that you feel is over the top is actually knowledgeable food people getting excited about quality product and their hopes that you, the general public, will get excited about something that is good too. If all of this "engineering" serves the purpose of getting people through the door at Edzo so that he can actually make the place work, feed his family and have some quality of life then I have a hard time understanding what about this is over the top. You might be happy stuffing your gullet at another quiznos, mcdonalds or any other corporate restaurant but I prefer to spend my money elsewhere and sadly, in this economy, options are shrinking. I have to concur with the above. I don't like to talk about because it was a pretty painful experience, but I had a restaurant, and it failed. Great reviews, loyal customers, a few revenue streams...just not enough of them. If you can succeed in this business, take care of yoru family and work under 80 hours a week you are a success, in my opinion. This owner isn't shilling here, he's not posting under some goof ball name, his publicist isn't even doing that. The media would not give good reviews in multiple places if the product was not worthwhile. And I saw a less than stellar review of Edzo's via Twitter today. It can go both ways. I guess part of me wonders why we are calling this out rather than any of the other hyped places there was chatter about when they first opened (I'm looking at you Alhambra Palace and Brasserie Ruhlmann). Sorry this is scattered - I've had a rough day and should be doing other things, but I couldn't let this one go. 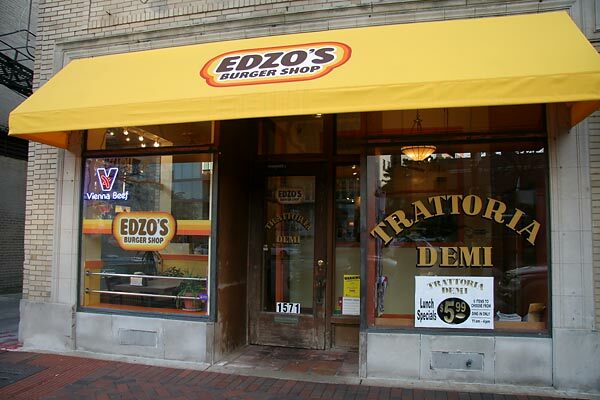 I went to eat at Edzo's (finally) yesterday for lunch. While I thought it was pretty good, I'd be hard pressed to give it a better review than that. Maybe it was the fact that I went in during the lunchtime rush. I ordered a griddled burger with cheddar and bacon, the garlic fries and a nutella shake. The burger was the part that made it just pretty good. I found the beef to be very salty (I pulled some of the bacon off to see if that was the culprit, but it wasn't), and the edges were not crispy at all, which is something I was really looking forward to. The cheese was fantastic, and the bacon was done crispy but not burned (perfect in my book). 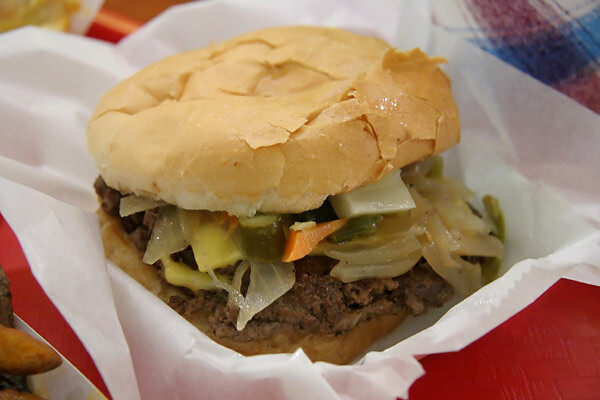 The bun was nice and robust without being too much, but the salty beef and mushy edges just weren't enough to push it to the really good category. 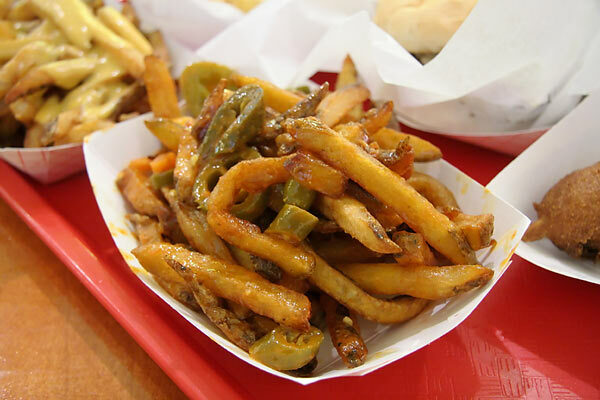 The fries, on the other hand, were very good. You could tell they were fresh, and the butter, garlic and parsley were delicious. I didn't finish them, because they did start to get pretty soggy near the end. I think if I ordered them again, I'd ask if they could cook the fries a bit longer to crisp them up to hold up to the butter. The nutella shake was Edzo's saving grace. I would venture to say it was one of the best shakes I've ever had. Very nutella-ey without being too sweet or rich. I actually had it as my main beverage, and it was perfect for that. Will I go back? 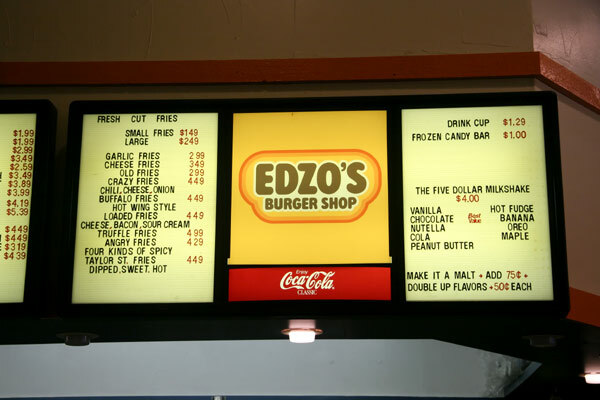 Yeah, I want to give Edzo's another chance, but if the burger isn't great, I'm not sure if I'll be back three times (well, maybe just for a shake after that). Regarding the consternation over lack of crisp edge, I offer an observation (not advice and certainly not criticism). At Carl's in St. Louis (thanks, da Beef) I watched a master creating entire burgers of crisp lattice. 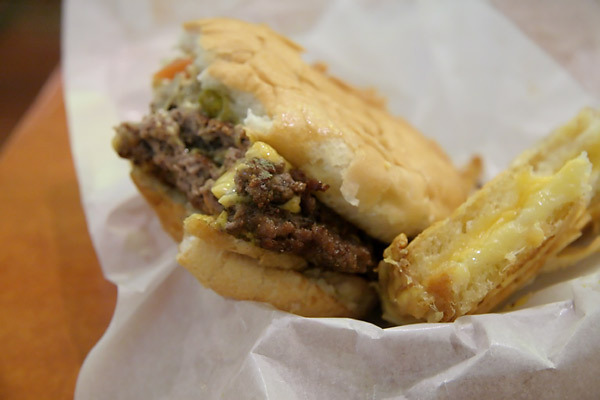 Though the style is now associated with Indiana, Carl's burger defines the style for me. 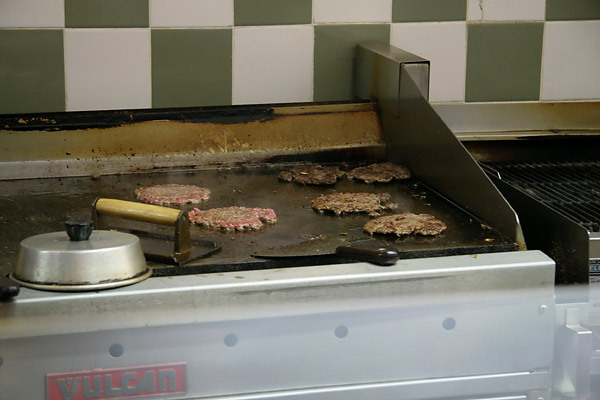 The man had a very hot grill; a very wide and razor sharp putty knife (he sharpened it on a stone constantly); and brutal technique -- slapping and smearing the raw burger into a layer so thin there was as much open space as burger in the meat circle on the griddle when it began to cook. But the swiss-cheese looking patties contracted and the gaps filled. And it was good. I have to be the only Mom in town that goes into a burger joint alone with two kids and leaves with a check just under $30. Not that this is a criticism of Edzo's prices (this happens occasionally at WASC, too...well, any given fast food restaurant with decent offerings, really) but my offspring ordered a double griddled hamburger with bacon and loaded fries (cheese, bacon, sour cream and spring onion) and tried to shake me down for...a shake. Actually, he was really interested in the P B & B, but was not to be deterred from the double hamburger, and I refused to order both. He ate the whole burger and about a third of the fries (I ate a regular burger and buffalo fries, nearly licked my plate clean) His companion ate a normal kid's meal, thank goodness. 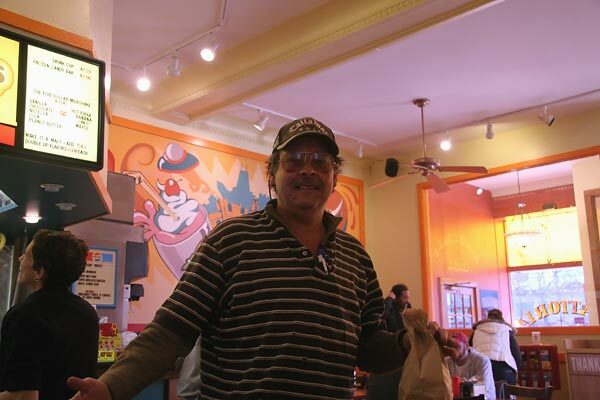 jim_ftw wrote: I went to eat at Edzo's (finally) yesterday for lunch. The continuing, and not too surprising, bugaboo at Edzo's is the lack of consistency. 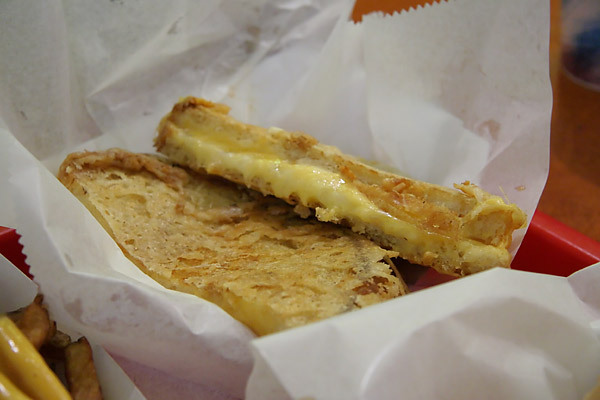 I had a double griddled at about the same time and , if anything, it was under salted. The burger was also dry whereas my first two trips produced very juicy results. 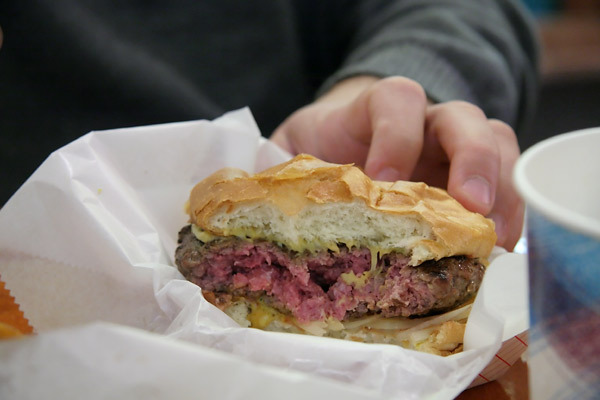 On our first visit one of three burgers was extremely salty and last week I had an 8oz burger that had two very salty bites while the rest of it was fine. One hopes that as time goes by the consistency will improve. Last edited by scottsol on November 4th, 2009, 8:01 pm, edited 1 time in total. I really want to try this place but their hours make it nearly impossible for me. I'm in Evanston a couple nights a week on average but never before 7. Cabbagehead and I enjoyed our lunch today at Edzo's--saw Mhays with kids in tow. I had the single griddled patty and found it a tad salty, but salty in a good way. I had it mit Merkt's cheese and "everything." Good bun and very good burger. Mine had crispy edges, and I agree with Mhays about the crisp pickle; I hate those spongy things some places serve. Cabbagehead had the large (8 oz.) patty melt. He ordered it medium rare, and that is what it was, and it correctly came on marbled rye. Excellent grilled onions too. It was an outstanding patty melt. I would order one if I didn't have to go back to work in the afternoon, but he is made of sterner stuff. We also had the garlic fries, which were initially forgotten in our order, so I think they hurried them up and as a result they were a bit underdone. Good topping, but a bit soggy. The nutella shake was really thick and delicious, but I am not the biggest nutella fan. Next time I'll try vanilla or chocolate plus banana. The place is still a bit smoky, but not so smoky that I still smell like grilled hamburgers (not necessarily a bad thing). Eddie was welcoming and working hard. We'll be back. Had a late lunch at Edzo's earlier this week and really enjoyed it . . . This was perfectly cooked on the inside but maybe could have used a touch more char on the exterior. Eddie told us that he and his crew were still familiarizing themselves with the grill, which had recently been repaired/adjusted. These were very tasty -- I loved the 4-way heat -- but my favorite of the 3 types of fries we tried were the ultra-crispy "old" fries with garlic. I think adding cheese to those would have made them perfect. 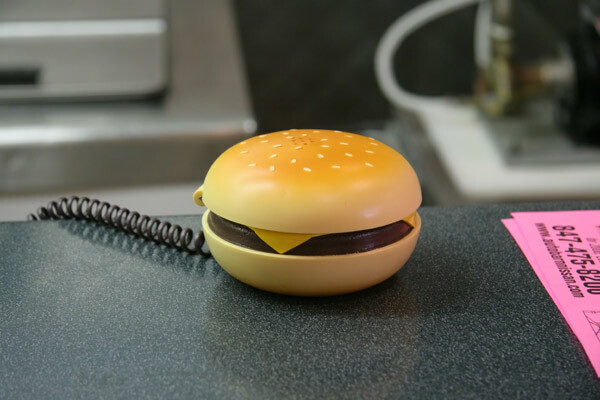 If you call in an order, is this the phone on which it's taken!? Overall, I really enjoyed the lunch -- especially the burgers and the old fries. The Nutella shake (not pictured) was excellent. I think both burgers, while very tasty, will benefit as the crew/the place gets some more mud in its cleats. Still, I think that Edzo's is already head and shoulders above most places in its genre. I get the feeling that the philosophy and objectives here will help it develop into the exceptional place it strives to be. I think Ed's already down to the fine-tuning. In addition to doing his homework, he's a guy who knows this food, knows what makes it good and, by his own admission, loves to eat. When he gets the final tweaks made, which seems imminent, this place is going to be a distinctive destination, probably with a line out the door. Finally made the trip to Evanston yesterday after an appointment in Skokie and the only thing I was disappointed in was I wasn't hungrier. Thanks to the many suggestions here, went with the griddled burger, garlic fries and Nutella malt, and really everything was excellent, especially the malt, which my wife kept trying to pry from my grip. Other items looked amazing, but the will just wasn't there, which means we'll have to come back and try the char burger, myriad fry choices, etc. Really, though, a great operation. Friendly service (they kept giving my wife the business because she had to be on a town hall meeting on her cell phone), great decor. You can really taste the quality and care. Will it change your world? Probably not. But that said, it really is a great place and makes me wish someone would take one of the many vacant store fronts in Highland Park and create an Edzo's North. Eddie came by after a bit and told me that he has two guys working the burger grills and one guy is spot-on getting the right texture and one is still a little leery of overcooking them, but they're getting closer all the time. 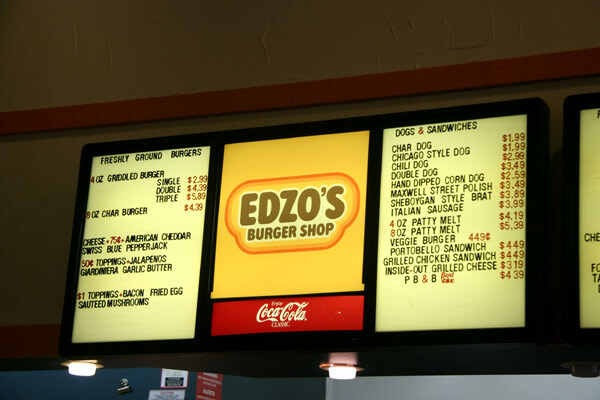 Anyway, as far as I'm concerned the promise of Edzo's approach is being fulfilled now and this has leapt into the top burgers in Chicago, especially for its price class, but by no means limited to that. 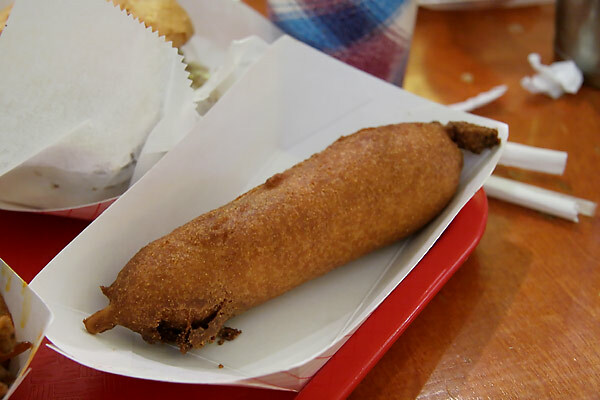 Kids loved the Nutella shake, too, though I think the corn dog could have stood to fry longer. And proof that that high-priced PR agency Eddie engaged is paying off: watch Monday at the Reader's food page for a little more Edzo's love. Great video. Now I just have to plot my return with a bigger appetite. thanks, Mike. Video turned out great--you're very talented. I was able to make it, finally, to lunch yesterday. Had the pleasure of great company and must add my voice to the swelling chorus: a meaty, beefy, burger with a truly exceptional bun, wonderful (almost understated) garlic fries, and a terrific Nutella shake. Indeed, I can't recall the last time I was so tempted to go back up and re-order the entire lunch just to have the pleasure of enjoying it all over again. I'll be leaving for the gym shortly, however, and fear to contemplate the result of having such a great lunch twice in a row. 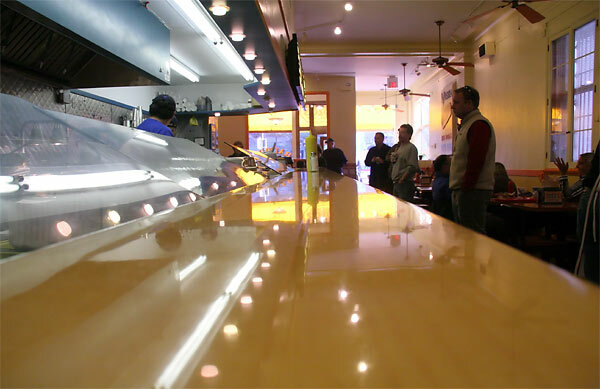 Nice space, nice counter folks, great food: what's not to like? Indeed, the steady line of customers says better than I possibly could that Mr. Lakin appears to have a great success on his hands.